Wargroove is a new tile based strategy game that was just released here in February 2019 and is already receiving acclaim from most review sites. While I personally agree with most of their points, I do see some room for improvement. 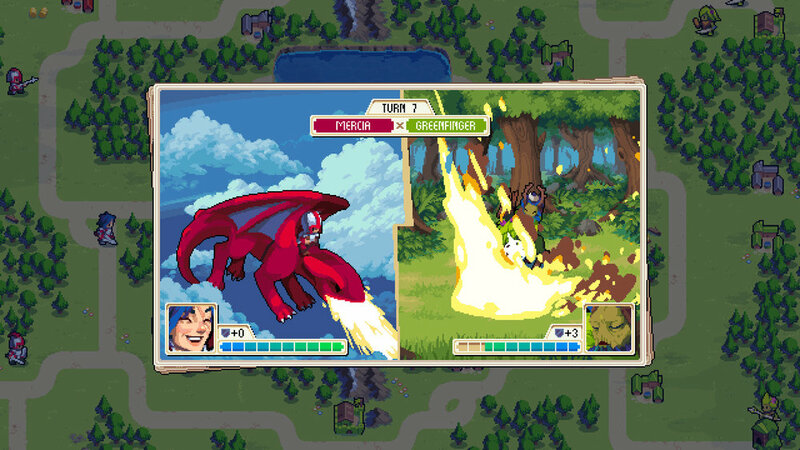 Wargroove is the kind of game that any player can hit their "groove" in with a local or online multiplayer mode, a solid story campaign, and a level editor guaranteeing plenty of room for creative minds and those hungering for more after they complete all the levels Chucklefish has in the game. With promises for DLC and updates, the developers promise to iron out a few issues, so hopefully most of my complaints will be covered. As is, there are a few points I hope to see get ironed out before I can give it a full glowing score. Mind you, I'm really loving the game and it will still get a very positive review. In Wargroove, the story of the solo campaign follows along with Queen Mercia of Cherrystone as she defends her homeland against the invading Felheim army. There are four factions in the game, also including the Heavensong and Floran tribes. All four factions have the same basic units available to them, but they are stylized in a way that makes them unique. Commanding officers have a special "groove" that can help you in a pinch. Each individual unit has a way to get a critical hit as well: an archer can nail one if they stand still from their previous turn's point, whilst a pikeman can get a critical hit if they are standing by another pikeman. Each turn you earn gold based on the number of towns you control, which can be used to recruit new units and build your army. My taste of strategy games has always been Fire Emblem. I'm used to crafting perfect characters, and levelling them up if they aren't performing up to par. Units in Wargroove are more like chess pieces, in that they have a set amount of health, defense, and attack power. It's up to you to decide how to move them about the board to take on the enemy. There really isn't any levelling of the units, so you have to find the right strategy to succeed. For me, this got frustrating a few times, as I'd be one hit from victory but couldn't do it because my unit couldn't move one more square, or couldn't get beside someone because of the crowd of characters. Many times I just wished they could attack diagonally because there was no way for me to get to the place I needed to be. I kept wanting to go back out and do other skirmishes to level up my team, but Wargroove is more about finding the perfect combination than building a powerhouse team. As I've played the campaign, I've noticed a few frustrations, both in level design and interface. The game does a good job of helping you clearly see what units can still do things and what can't, but it's difficult to see the step-by-step interactions that some strategy games can show by default. When highlighting an enemy, you can see it's range, but only one at a time and only if you hold down a particular button. Over on Fire Emblem, I'm used to a toggle that simply shows all dangerous areas on the map. I can then highlight one of my personal troops, see their field of movement and attack, and figure out a strategy to move forward. Also, I see no directly obvious way to toggle between active units. Sometimes I may finish my main skirmish and wonder why my turn isn't over; it's simply because I have one guy off in a corner or have the ability to create a soldier I don't need (or can't even afford). You can manually end your turn, but it's just another step in the process. Within the campaign, I had issues with "surprises" that pop up. In a multiplayer game you know you are dealing with the same ruleset across all players. In solo, however, you will find times that surprise enemies pop up from random places, or reinforcements slide in from the side of the screen. A lot of these are unpredictable. Whilse scripted, they can be a frustrating hurdle in a game demanding extensive time per battle. Skirmishes tend to last a half hour minimally. One wrong choice can send you spiraling toward defeat and there's not much you can do other than watch. Surprise or not, it can get irritating to be one square away from victory and watch the enemy army slice your strongest warrior to ribbons because of that. My favorite bit of strategy does come from that frustration, though: unit health is directly related to damage. Instead of being a solo unit like Fire Emblem who continues to deal the same damage no matter what, Wargroove units are thought of as teams. If a team of four fighters goes into a battle and loses 50% health, two of those fighters die and take half the damage-dealing capability of the unit with them. If you head back to town with the unit you can heal it, but that takes turns away from your units as you run away and gives your enemy another chance to recruit more units to their side. It does feel good to see a big baddie with 90% health who can kill your little 10% unit, but if you bring a fresh unit in who can cut 80% off of the enemy your little 10%er can finish them off before they have a chance to fight back, saving your unit in the process. Dialing in the perfect combo to keep your units alive is what really makes this game fun to play. I personally wish there was more dynamic movement to the game. All the units don't seem to be able to move very far, and that distance is stunted even more with rough terrain or large clumps of heroes and villains having at each other. It took me two extra turns to knock down an enemy encampment simply because I couldn't get all my units close enough to it with only four tiles in a square around it able to be attacked from. Getting hit lowers your attack power, but it just makes you want to play defense until you see a hole open up. Each unit has a fairly limited attack so there's not a lot of strategy outside of recruitment and placement, all of which takes a long time to power through. There are gamers who will drool over every single one of my complaints, though. Slow unit recruitment leads to smarter strategies to keep the ones you have alive. Limited movement and lack of leveling translates to deeper, chess-like strategies. Long campaign levels mean you really have to think several moves ahead. While I am seriously enjoying finding my "wargroove" here, I don't see myself getting drawn in like I do in Fire Emblem, where weapon customization and levelling make me feel more in control of my units. With it's well-designed levels, cute and smooth animation, and balanced gameplay units, fans of the Advance Wars series of games will find a medieval love letter to the core of what made those games great. Right now, Wargroove is a wonderful and solid title with a lot of potential. If the developers follow through with their promises to hear the community and adjust the game accordingly, we could be left with a classic on our hands. Thank you so much to Chucklefish for allowing us here at The Gamer's Lounge to review Wargroove. This is the solo review right here, but Wargroove will be part of our new podcast roundtable review in March, where a group of our writers all got to play and will be discussing the pros and cons within. Follow our Twitter or Facebook page to keep up with the podcast!